Abrahamic religions is a term used to refer to the monotheistic religions of Christianity, Judaism, and Islam which trace their origin to the religious tradition of the Biblical patriarch, Abraham (1996 BC–1821 BC). Abraham was born in Ur of the Chaldees and was originally called Abram until God changed his name while making a covenant with Abraham when he was 99 years old Genesis 17:5 . He is considered a prophet, and was the father of the Israelites, Ishmaelites (Arabs), Midianites, and several other races. In Canaan, God promised Abraham that his descendants would inherit the land from the Nile to the river Euphrates and have it for ever. Although Sarah was childless, and apart from God's promise there seemed no reason to think she would ever have children, Abraham trusted God that He would fulfill His promise to give them children. Abraham had a son, Ishmael, by his maidservant Hagar, then another son, Isaac, by his wife Sarah when she was 100 years old. Jews trace their lineage to Abraham through his son Isaac. One of the core tenets of the Jewish faith is that the Hebrews are the "chosen people of God" following God's covenants with Abraham. Judaism is the world's first monotheistic worldview, and is foremost among the three great monotheistic religions, since from it came Christianity and Islam. The foundation and principles of Judaism are found in the Hebrew scriptures or the Jewish Bible, more widely known as the "old testament", which is part of the Christian Bible, along with its history. A proper name for the Bible of the Hebrews is the "Tanakh" which is an acronym for the different sections of it: the Torah, or the Instruction, the Law, the five books of Moses; the Nevi'im, the Prophets; and the Kethuvim, the Writings. The most revered section is the Torah, which is the foundation for the rest. 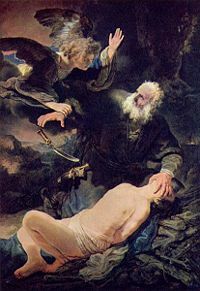 Christians also trace their faith back to Abraham through Isaac, via Jesus and his original followers, who were Jewish. Christianity is the largest religion in the world with approximately 2.14 billion adherents. A Christian is someone who follows the precepts of Jesus Christ. The foundation and principles of Christianity come from the New Testament of the Bible, along with its beginning history. During the life of Jesus, his disciples were exclusively Jews. After Christ's death, Gentiles or non-Jews were brought into service, which now dominate Christianity. His disciples were known among themselves simply as "brethren", "the faithful", "elect", "saints", or "believers." The name "Christians" was first given by the Greeks or Romans, probably in reproach, to the followers of Jesus ("little Christ's!"). Muslims trace their lineage back to Abraham (known as Ibrahim) through his son Ishmael. Islam (Arabic: الإسلام, al-’islām) is a religion founded by Muhammad (Mohammed) in AD 622 during the Umayyad aristocracy (a golden age for the Islamic Ummah in which it was specifically Arab). Islam practices a theology based in the teachings of the Qur'an. An individual who follows Islam is called a Muslim. According to Islamic belief, Isa or Jesus was but one prophet sent by Allah to pave the road for the ultimate revelation of God founded in Islam and revealed to Muhammad by the angel Gabriel. Gabriel revealed Allah's last message, found in the Qur'an to the final prophet, Muhammad. The word Allah (الله‎) is the name of God predominately used by Muslims and the word Islam means "submission" or total surrender to the will of Allah. This page was last modified on 16 December 2012, at 23:23.